The ISLE Airtech® 10′ All Round Inflatable Stand Up Paddle Board is designed with riders of all skill levels in mind, and easily gives a great paddling performance up to 200 lbs in weight. The highly versatile design makes the ISLE Airtech® 10′ a practical option for small surf performance and flat water, while the 6” thickness is appreciated for providing the type of stable ride that is standard with the alternatives in hard epoxy. Extremely rigid – Great for small waves, river runs, and flat-water, this SUP has a surf style design and easily accepts the beginner paddler up to 200 lbs. Plus, this paddle board has a bungee cord system in place to easily accept extra gear. Highly durable – The military grade material used in the construction of the SUP makes it extremely resistant to knocks and bumps. Even if it runs into a pier or rocks, this type material is virtually impossible to damage. Portable – This SUP is certainly built with portability in mind and easily packs down into a small package (rolls to a size similar to a sleeping bag) and great for transport and storage. In its fully deflated state it is sized 1-ft in diameter by 36 inches in width. And the weight is in the region of 24 lbs. 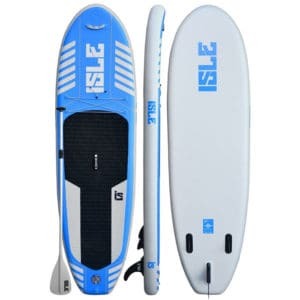 Package deal – The ISLE Airtech is fully packaged SUP and includes the actual board, removable travel fin, high-pressure pump, and adjustable, 3 piece adjustable paddle. 2-year warranty – ISLE Surf and SUP fully stand behind their products and give cover against material defects or workmanship issues. If you really want to get a full appreciation of what other paddle board riders are saying about the ISLE Airtech® 10′ Inflatable Stand Up Paddle, why not read the following pros and cons that have been sourced from real customer feedback. A fantastic SUP, the ISLE Airtech® is a practical option for all types of SUPing fun and easily accepts the rider up to 200 lbs in weight. With its light weight construction, great looks and ability to track well, this inflatable is certain to appeal to those starting out on their first paddle board adventure. The ISLE Airtech® 10′ Inflatable Stand Up Paddle Board has a solid 4.7 out of 5 rating on the Amazon marketplace to provide a bestselling iSUP that is extremely versatile and great on both flat-water and small surf.